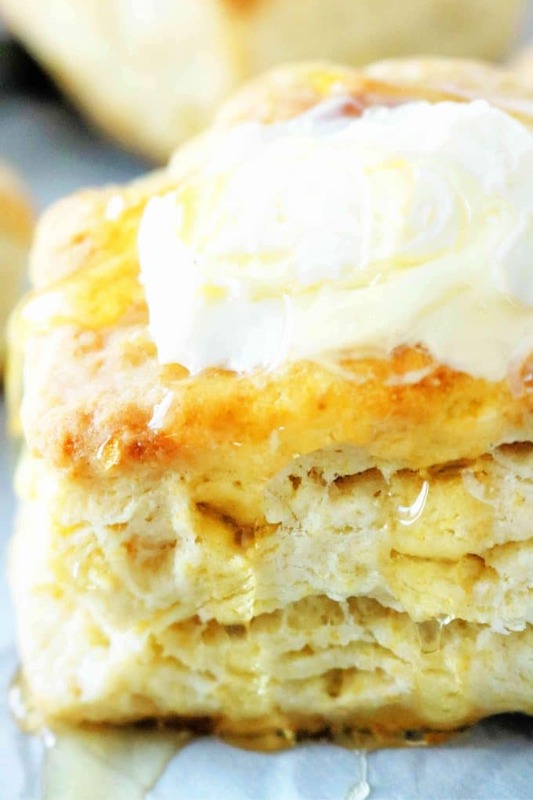 In addition to a seriously easy buttermilk biscuit recipe, we’ll cover all the biscuit basics including what it takes to keep a biscuit light and fluffy, the tips and tricks for layer upon layer of flaky biscuit heaven, plus, how to store your baked biscuits! WHAT DO YOU WANT IN A BISCUIT? Just like there’s more than one way to solve any problem, there’s more than one way to make a biscuit. In fact, there are lots of ways to make a biscuit, but, when it comes to making a really good biscuit it’s all about the right quantity of the right ingredients. You’ll find hundreds of biscuit recipes circulating through the web — biscuits made with milk rather than buttermilk, biscuits with a mix of shortening and butter, biscuits with no butter at all, biscuits with self-rising flour and even biscuits made with cake flour, but all biscuits will consist of these four primary ingredients: flour, fat, levener, and liquid. How you bring the four together makes all the difference. So how do you know which recipe is right for you? Well, that totally depends on what you want in a biscuit. 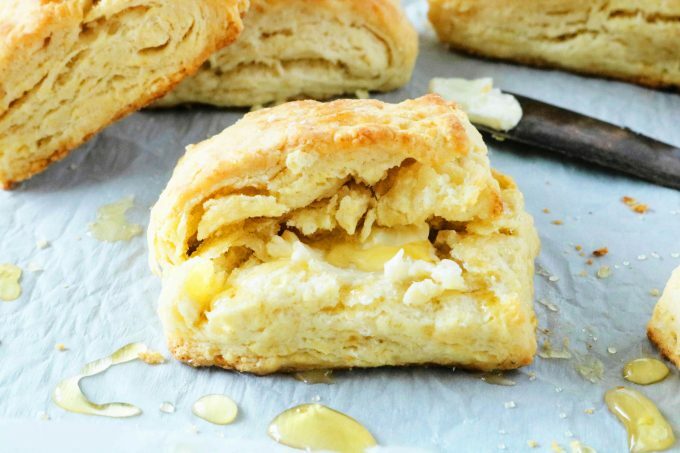 If you are looking for a high-rise, buttery biscuit with layer upon layer of golden flaky goodness, you’re in the right place, and this buttermilk biscuit recipe has got your number. 1) “Buttermilk” biscuits in-and-of themselves have already got you on the right track when it comes to making a tender and fluffy biscuit. This is due to the tenderizing powder of the buttermilk. The acidity in buttermilk helps to break down long, tough gluten strands in baked goods, which in turn, helps them to stay tender. 2) If only it were up to the buttermilk and the buttermilk alone. Alas — we ourselves play a large role when it comes to the tenderness of our biscuits. The good thing is, the key to light and fluffy homemade buttermilk biscuits is to not overwork the dough. Take care not to over-stir the dough once you’ve added the liquid, and use a gentle touch while working with the dough on your floured work surface. So what makes your biscuits flaky? It’s all about the butter. And, not just any butter — cold butter. The colder, the better. The cold butter speckled throughout the dough helps to create little steam pockets which, in turn, create the layers. We now know buttermilk, along with using a light touch while working with the dough, will ensure our homemade biscuits are extra tender, and using cold butter in our dough will create the layers. Now, we’ll discuss how we bring it all together! 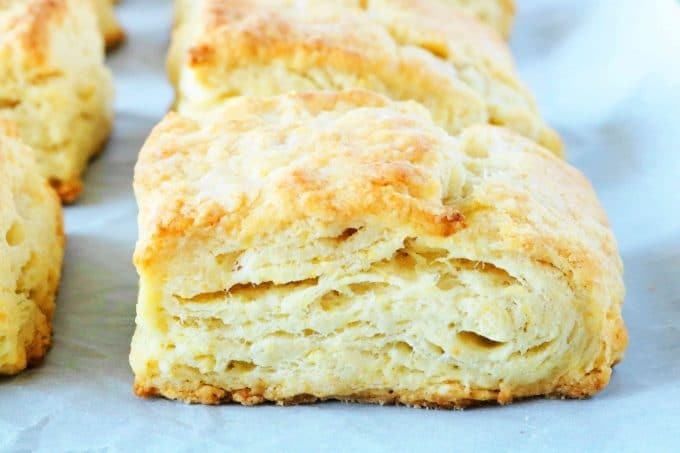 Homemade buttermilk biscuits are easy to make, and after only a few simple steps, you’ll find yourself pulling a batch of perfectly flaky, buttery buttermilk biscuits from the oven! Mix together the dry ingredients: flour, sugar, baking powder and soda, and salt. Gently knead to combine and fold dough over like a piece of paper (see example below). To begin making homemade buttermilk biscuits, you’ll first mix together your dry ingredients. You can use a whisk or a spoon. Then, your butter gets cut into the flour mixture. Remember, the butter should be very cold! To cut in the butter you can either use a pastry blender or two knives. I would highly recommend the pastry blender route as it makes very quick and easy work of cutting in the butter. Once the butter has been broken up and resembles tiny little peas, add the buttermilk. You’ll pour the buttermilk over the ingredients and stir just until combined. Once the dough starts to come together, stop stirring! Gently knead the dough just until it all comes together. 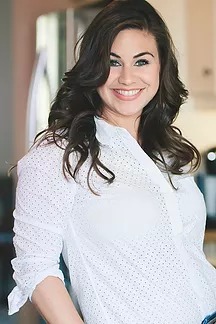 [For a brief tutorial on kneading from King Arthur Flour, click here.] Then, transfer the dough to a flour work surface and gently pat it out into a rectangle. Here’s where the extra layers come in! Fold one side of the rectangle over (the short side), then the other — just like you’re folding a piece of paper to go into an envelope. Then pat it out into a rectangle and it’s time to cut the biscuits! At this stage, you can either pull out a round biscuit cutter or cut the dough into squares using a knife. Cutting biscuits into squares is easier because it keeps you from having to bring scrap dough back together to use up all the dough and cut out more biscuits. This method actually keeps the biscuits more tender since they have been handled less! 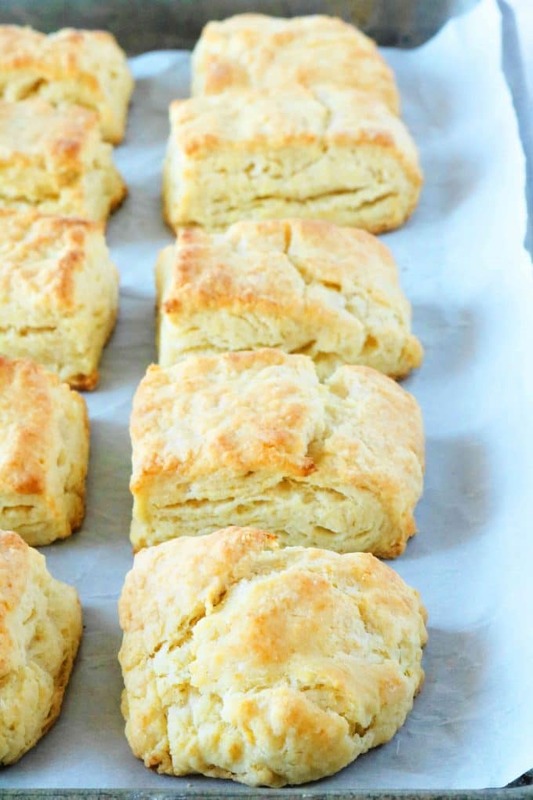 WHAT TEMPERATURE TO BAKE HOMEMADE BISCUITS? Biscuits and pastries are typically baked at very high heat, anywhere from 400-450°. Baking buttery baked goods at high heat helps to prevent them from spreading. Remember all that cold butter speckled throughout the dough and those little air pockets that formed from its steam, making high-rise biscuits for us with tons of flaky layers? High heat helps to set those layers in place! Sadly, homemade biscuits start to lose their lovely texture and freshness after just a day or so. However, you can store them at room temperature for up to 3 days. If you’d like to make homemade buttermilk biscuits in advance, you can bake a batch, and place them in a freezer-safe, gallon-sized ziptop bag or a snug airtight, freezer-safe container. Do not allow room for lots of excess air. Store in the freezer for up to 2 months. 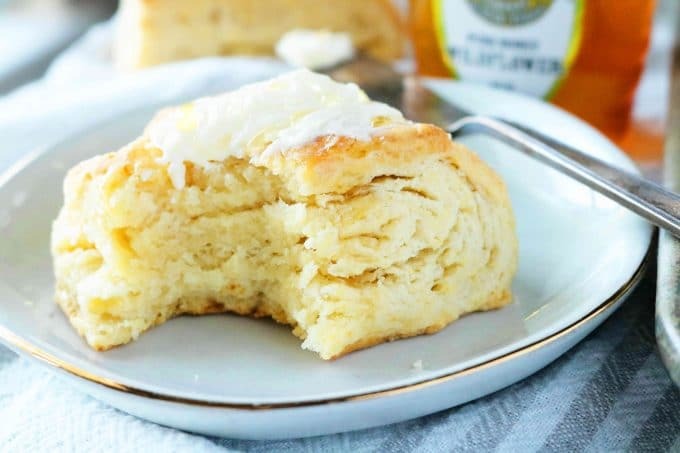 These homemade buttermilk biscuits will leave you with no regrets, and they always bake up with a gorgeous golden hue, a soft and fluffy texture, and a flavor that’s truly out of this world. You’ll find them easy to make, and they’ll be your go-to recipe for the years to come! Top them with butter, honey, or enjoy them as us Southerners do — smothered in sausage gravy. It’s pure breakfast heaven. Any which way you choose to enjoy, you simply can’t go wrong. 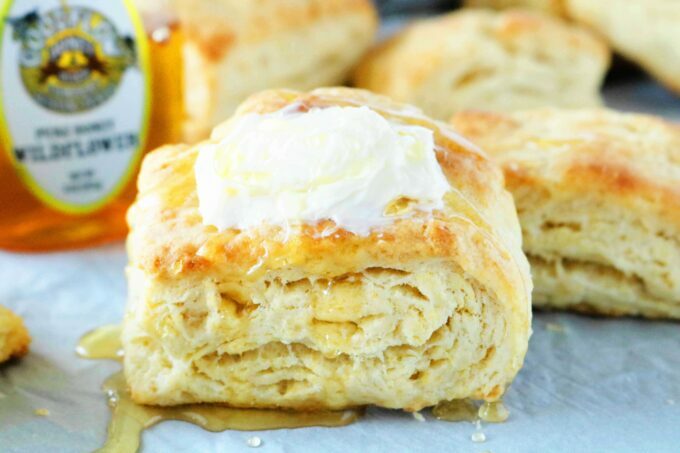 Homemade Southern Biscuits come together seriously fast for an easy morning treat. They’re perfectly golden on the outside, flaky and buttery on the inside. Use this recipe if you’re out of buttermilk! Homemade Biscuits and Gravy features homemade biscuits and the best recipe for scratch-made sausage gravy — a creamy white gravy speckled with black pepper and pork breakfast sausage! Easy Drop Biscuits with Cheddar and Chives are great for a quick weeknight side dish, and an all-time savory favorite to pass around the table! Homemade Garlic Bread is quick and easy to make, and a wonderful accompaniment to pasta night! Featuring a simple spread made up of butter, oil, garlic, and Parmesan cheese. Easy Homemade Cornbread feeds a crowd and makes for one impressive presentation ballooning out of its cast iron pan, and always bakes up tender and moist! 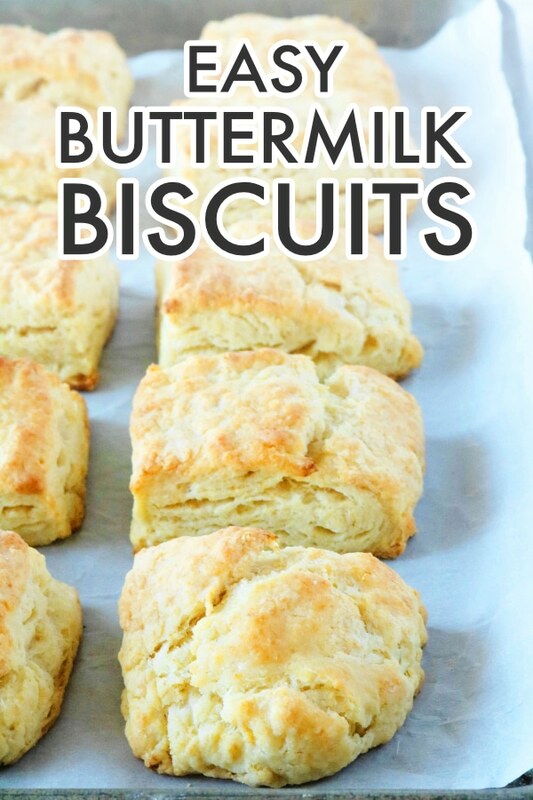 A quick and easy recipe for the best homemade buttermilk biscuits ever! Preheat the oven to 450° and have ready a baking sheet lined with either parchment paper or a silicone baking mat. Add the cubed butter and stir. Using a pastry blender, cut the butter into the flour mixture until it resembles small broken up peas. Add the buttermilk and stir until evenly distributed throughout the batter. Very gently, knead the dough, just until it comes together in a ball. Transfer to a lightly flour floured work surface and pat into a rectangle. Fold the sides of the dough over and onto itself, just as if you were folding a piece of paper to place in an envelope. Pat out into a rectangle once more and cut into 10 square biscuits. Alternatively, you could use a round biscuit butter. Place on the prepared baking sheet and bake for 10-13 minutes, just until the tops are golden. Serve and enjoy. Do NOT substitute salted butter for the unsalted butter called for in this recipe. I feel like picking one from the screen and eating it too. These look crazy good. I liked all your tips and tricks to make these at home. Very useful. 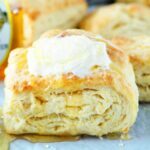 These buttermilk biscuits look so fluffy and delicious! They’ll be perfect for breakfast or with dinner! What delicious looking biscuits. love that they are made with butter and buttermilk. I appreciate your tips on how to ensure they are light and fluffy. Can I have the one with the butter dripping out of it? I am all about the buttermilk biscuits. It is the only way in my opinion! Just made these after many tries with different recipes and these were the winner!! Sooo good and the southern girl has finally found her staple biscuit recipe. Thanks! Well, that is such a compliment! Thank you so much, Hailey!!!! Totally craving biscuits with butter now! This is such a great staple recipe to have on hand! Growing up we always had bread and butter – biscuits were a treat but this is easy enough for any occasion!